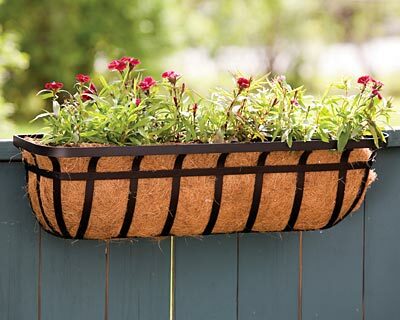 Create more planting space around your home with the Panacea Flat Iron Series Planter Box. Flat metal bars run vertically from the base to the top of this planter, and intersect with a horizontal bar near the top. The metal flares outward from this bar and culminates with another horizontal bar, for visual interest on the item. The included coco liner prevents soil from spilling out, and the generous 30" long planting area offers room for several herbs or flowers. Use the included adjustable mounting hardware to mount this planter to a wooden 2 x 4, wooden 2 x 6, or iron railing, or attach it to a wall with the two keyhole openings on its back. The black color on the flat bars adds a timeless look, and the durable finish will withstand the elements for several seasons. Bring plants onto your deck with this Flat Iron Series Planter Box.